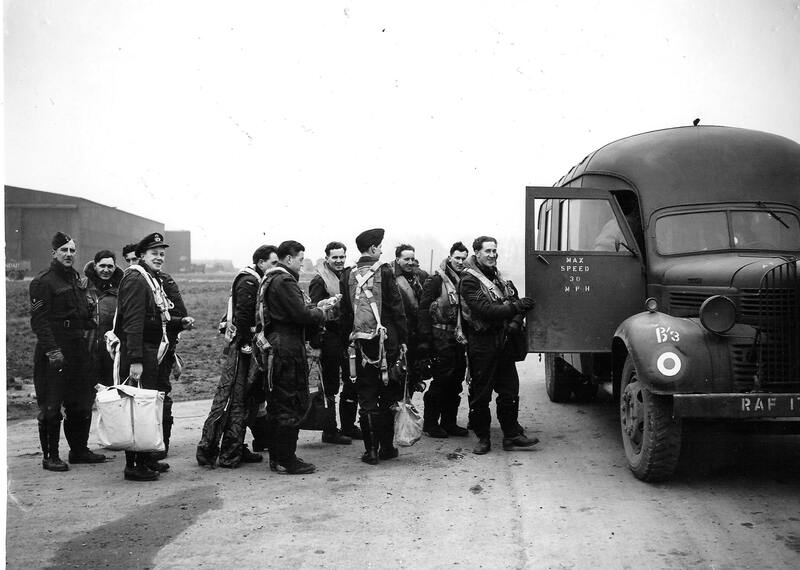 75 (NZ) Squadron C Flight crews boarding the Bedford crew bus to go out to their respective aircraft parked at dispersal – Mepal, 23rd March (February) 1945. The navigators all carry large gear bags. Amongst the RNZAF boys is far left, Pilot Ben Klitscher, Navigator Colin Emslie (with officer’s cap, carrying bag, Ware crew, C Flight) and members of the Russell crew – A/B Vic Hendry (centre front, side-on with cigarette), Pilot Wynne Russell (centre, looking straight at camera), Navigator Neville Selwood, W/Op Fred Jillions, R/G George Robson, and F/E John Hunt (far right). Colin flew in JN-M The Captains Fancy, while the Russell crew flew in PB418, AA-C. Many thanks to Roger for contacting me after the post I made about the Klitscher crew, regarding his Father, David Walter King, who was the Navigator with the crew. A few weeks ago Chris sent me the photograph above, showing members of the Ware and Russell crew. Also identified in the caption on the far left of the group is Ben Klitscher. Roger also sent me a copy of this picture and was able to additional identify his Father, David amongst what we must assume are 2 other members of the Klitscher crew. Very interestingly, the caption needs to be amended – the navigator stood with Ben Klitscher isn’t Colin Emslie, but is in fact David Walter King. 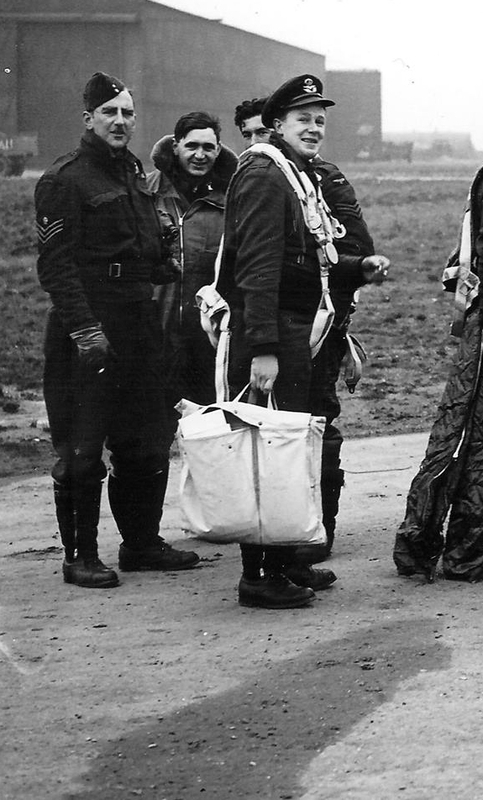 David King, Navigator with the Klitscher crew, stood to the right of the group with his map bag, Skipper Ben Klitscher, stood on the left. 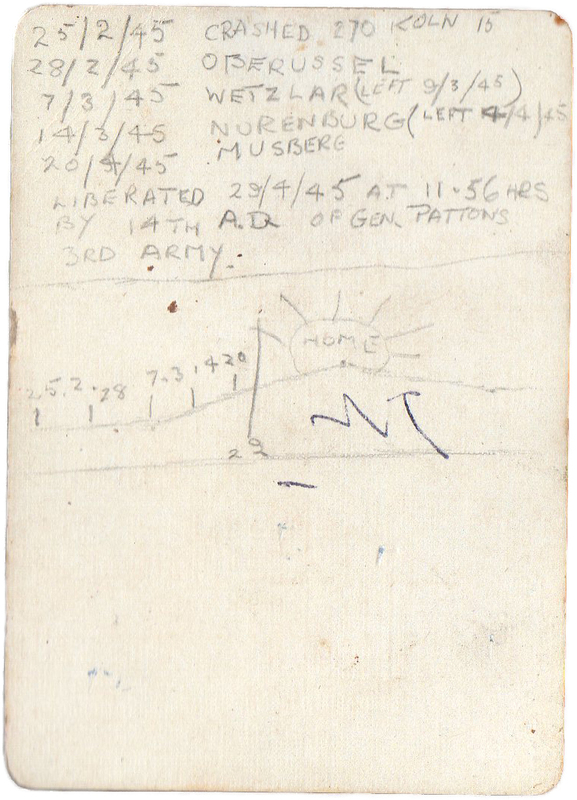 The above images show a pack of cards that David had on the Mooseberg march at the end of the war – amazingly, on the back of one he has recorded their progress on the march. There were 3 main routes that allied Prisoners of War took during this period. David and his fellow prisoners took – the “Southern route”, from Stalag VIII-B (formerly Stalag VIII-D) at Teschen (not far from Auschwitz) which led through Czechoslovakia, towards Stalag XIII-D at Nuremberg and then onto Stalag VII-A at Moosburg in Bavaria. (this is confirmed on David’s Recovery Form below). Perhaps ironically, given that the crew crashed just ahead of the advancing American 8th Army, that ultimately he and his fellow prisoners were liberated by the American 3rd Army. This entry was posted in general and tagged 1945, 25th February 1945 Kamen, 75(NZ) Squadron RAF, Aviation, Bomber Command, D.W.S Amps, David Walter King, John Duncan Craven, K.A. Blackbee, Lancaster Mk.III LM740 AA-B, Louis Eldon Bernhardt 'Ben' Klitscher, Mepal, Moosburg, P. Brooke, Stalag VIII-D, Stalag XIII-D, W. H. H. Brewer, W.C.F. Pilkington, World War 2 on September 29, 2014 by 75nzsquadron. I have been contacted by Lois regarding her Father, Louis Eldon Bernhardt ‘Ben’ Klitscher. Ben arrived with his crew at Mepal on the 30th of January 1945 and flew 5 Ops with his crew before being shot down on the Kamen Op on the 25th February. Lois is very interested to find out additional information about her Father and his crew – looking at the gaps in the crew information regarding first names and information related to their internment as Prisoners of War, there must be a chance to add to the information of the Klitscher crew. NZ415262 F/S Klitscher L.E.R. and crew arrived on posting from 3 L.F.S. F/S Klitcsher as 2nd Pilot. F/S Louis Eldon Bernhardt ‘Ben’ Klitscher, RNZAF NZ415262 – Pilot. P/O David Walter King, RAFVR 1603821/ 164563 – Navigator. Sgt. W.C.F. Pilkington, RAFVR – Air Bomber. F/S P. Brooke, RAFVR 1312079 – Wireless Operator. Sgt. W. H. H. Brewer, RAFVR – Flight Engineer. Sgt. K.A. Blackbee, RAFVR – Mid Upper Gunner. Sgt. D.W.S Amps, RAFVR – Rear Gunner. F/O Alec Gordon Leech, RNZAF NZ413093 – Mid Under Gunner. Twenty one aitcraft were again detailed to attack Wesel. AA”J”, captained by F/S Lukins, B.L., returned early through engine trouble. Cloud was 1-10/10ths with some haze. A few crews were able to identify the river bend. Bombing appeared to be accurate. Very slight H/F was the only opposition. Bomb Load 1 x 4,000 H.C., 9 x 500 ANM., 3 x 250 G.P. F/S W.C.F. Pilkington, RAFVR – Air Bomber. Bomb Load 1 x 4,000 H.C., 9 x 500 ANM., 4 x 250 G.P. 1 Munro. *The reason for Sgt. Brooke’s absense from the crew is not known, but his replacement John Craven suffered a cruel twist of fate. 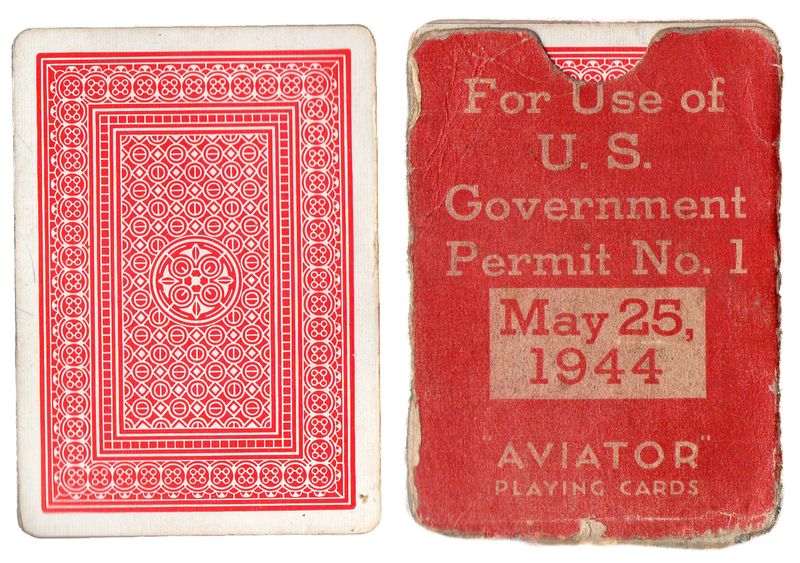 F/O Cravens appears to have already completed a full tour with John Perfrement in mid 1944. John Craven’s presence back in the Squadron at this point was not something I was aware of and needs to be looked at as well…..
LM740 was en route to the target and was seen to leave the stream near Wesel, approximately 50 miles from the target with the port-inner engine feathered after being hit by heavy flak. The seven crew then apparently abandoned the aircraft after turning for home and landing relatively uninjured in enemy territory. They were all captured as Prisoners of War. No information regarding Prisoner of War Number, camps. 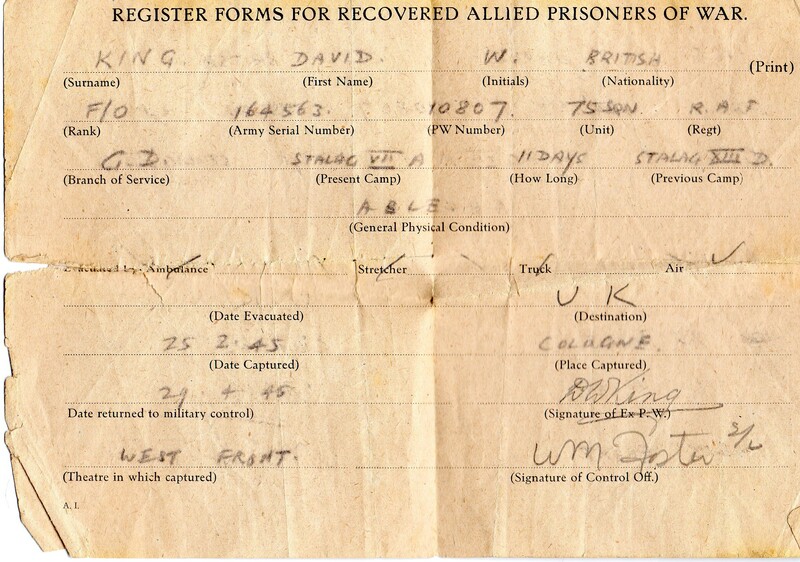 No information regarding Prisoner of War Number, camps or return date. 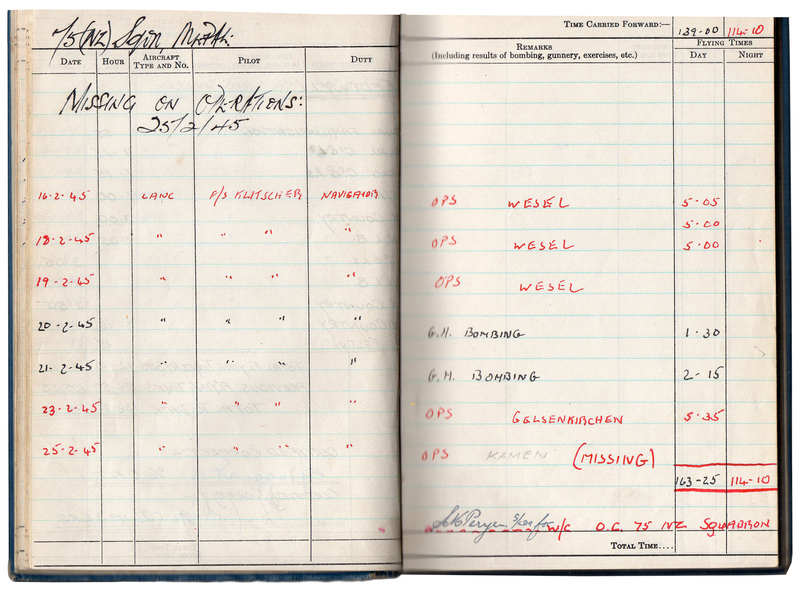 F/O John Duncan Craven, RAFVR 1007069/ 57882 – Wireless Operator. This entry was posted in general and tagged 1945, 25th February 1945 Kamen, 75(NZ) Squadron RAF, Aviation, Bomber Command, D.W.S Amps, David Walter King, John Duncan Craven, K.A. Blackbee, Lancaster Mk.III LM740 AA-B, Louis Eldon Bernhardt 'Ben' Klitscher, Mepal, P. Brooke, W. H. H. Brewer, W.C.F. Pilkington, World War 2 on September 14, 2014 by 75nzsquadron.